I very much enjoyed reading Carl Nygren’s 2008 column, Graphite Clamshell iMac Still a Real Eye Catcher and Useful Tool about his Graphite clamshell iBook SE. Wow! A cherry clamshell complete with built-in DVD drive, manuals, and CD for fifty bucks. I’m envious. Along with the 12″ PowerBook, the clamshell is one of my favorite Apple notebooks that I haven’t actually owned, although I came close – especially after the clamshell’s only major upgrade was rolled out in September 2000 at Macworld Expo Paris (Carl’s iBook is one of these “Paris” models). While under the hood, RAM remained at 64 MB and bus speed at 66 MHz, the processor specs were changed from the former PowerPC 750 with 512 KB of Level 2 cache running at 150 MHz and 183 MHz (half of CPU speed), to IBM’s then-new 750cx chips with 256 KB of onboard L2 cache running at 366 MHz and 466 MHz – full CPU speed. The hard drive was increased to 10 GB, and the other big news was that the iBook finally had FireWire and an “AV” video-out port (no VGA or ADC monitor port, however). To top it off, the 466 MHz SE came with a DVD-ROM drive. The Paris iBooks also got ATI Rage Mobility 128 video with 8 MB of VRAM that also did yeoman service in the Pismo PowerBook and early dual USB iBooks. Still no sound-in, although increased availability of USB microphones has mitigated that issue somewhat. The price on the standard iBook was also dropped by $100 to $1,499 – the same price point as the top-end black MacBook. In late 2000 and early 2001, I was in the hunt for a system upgrade from the WallStreet LE PowerBook I had been using as my production workhorse for the previous couple of years. I was weighing the relative merits of the then-current Lombard (and later the Pismo) vs. the new iBooks. 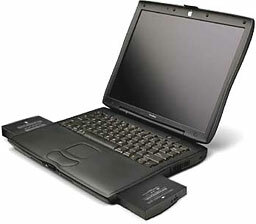 The main sticking point for me was the clamshell’s 12.1″ 800 x 600 resolution display. I was intimately familiar with this screen, since it was the same one used in my 233 MHz WallStreet LE, and its cramped confines were a big part of the impetus for moving up to a new system. I can (and still do, with my two Pismo PowerBooks) get along quite happily with a 1024 x 768 pixel display, and if the clamshell had been available with a 12.1″ screen of that resolution (which came with the dual USB iBook in May 2001), I might well have bought one, because in most other respects the 466 MHz SE model would have suited my requirements nicely – and eventually a 700 MHz dual USB iBook did displace the WallStreet. On the other hand, my wife, who used the WallStreet for several years after I retired it from production service, says she preferred the 800 x 600 display after she moved on to the 700 MHz iBook as her next hand-me-down system, although she has gotten used to it and now says she loves the little iceBook. Another issue with the iBooks, both clamshell and iceBook, is that they were (understatement) not really user serviceable when it came to hard drive upgrades. Changing the hard drive in a WallStreet or Pismo is a 10 to 15 minute job. With the iBook, it’s not recommended at all for folks who are not trained technicians, and with good reason. However, the Paris revisions fixed or eliminated most of the shortcomings that had decided us against the previous generation clamshell iBook in early 2000 when one of my offspring was obliged to replace a stolen WallStreet with a new ‘Book. Lombard offers SCSI support for his CD burner. FireWire can be added with a PC Card adapter when and if the need arises. Lombard came with 64 MB of RAM; the iBook only 32 MB, which negated some of the price advantage. iBook officially supported a maximum of 160 MB of RAM. Lombard has a bigger hard drive. Lombard has a 14.1″ 1024 x 768 display; iBook a 12.1″ 800 x 600 display. Lombard (333 MHz) has a faster processor with a larger processor cache. Lombard has sound-in support, a microphone, and stereo speakers; iBook has no sound in, no microphone, and a none-too-great mono speaker. No provision for adding FireWire support to the iBook. Lombard has 8 MB of VRAM and ATI Rage Pro video; iBook has 4 MB VRAM and the less wonderful ATI Rage Mobility video. Lombard has an expansion bay and PC Card slot; iBook has neither. Lombard has two USB ports; iBook has only one. iBook has no IrDA port or video-out port; Lombard has both. The standard iBook and the low-end PowerBook were priced at at $1,599 and $2,499 respectively – a spread of $900. However, at the same time as the Pismo PowerBook was released at Macworld Expo Tokyo 2000, Apple also added an upmarket iBook SE model at $1,799 and upgraded the basic 300 MHz iBook, which got 64 MB of standard RAM and a 6 GB hard drive, the same as the low-end (400 MHz) Pismo PowerBook, which arguably narrowed the value gap. Or did it? SCSI was no longer a comparison issue – neither machine had it. But Pismo comes with two FireWire ports. iBook (Early 2000) still has no FireWire support. Both came with 64 MB of RAM. iBook now officially supports up to 320 MB of RAM; Pismo officially supports up 512 MB – or even 1 GB with a couple of minor functional limitations. Both computers came with a 6 GB hard drive, but Pismo could be built to order with up to 18 GB. Pismo has a 14.1″ 1024 x 768 display; iBook a 12.1″ 800 x 600 display. The PowerBook’s base processor was now 400 MHz with 1 MB backside cache – 33% faster in clock speed and a 100% more cache than iBook’s 183 MHz 512 KB backside cache. Pismo also has a 100 MHz system bus, versus iBook’s 66 MHz bus. Pismo has sound-in support, a microphone, and stereo speakers; iBook still has no sound-in, no microphone, and a none-too-great mono speaker. Still no provision for adding FireWire support to the iBook. Pismo still has 8 MB of VRAM but has jumped way ahead of iBook in video support with its powerful ATI Rage Mobility 128 graphics, plus support for a Zoom Video PC Card; iBook still has 4 MB VRAM and the less wonderful ATI Rage Mobility graphics controller with 2x AGP. Pismo has an expansion bay and PC Card slot; iBook still has neither. Pismo has two USB ports; iBook has only one. iBook has no IrDA port or video-out port; Pismo has both – and also supports dual displays. Pismo came standard with a DVD-ROM drive; iBook did not support DVD. In my estimation, Pismo still had a substantial value edge, and in some respects (DVD, video support, processor speed, bigger cache, faster system bus) had widened it. The iBook’s bigger hard drive and more standard RAM helped, but they were not compelling. The first-iteration iBook SE came in graphite, had a 366 MHz processor, and cost $200 more than the standard blueberry and tangerine iBooks. The aesthetics alone might have been worth the extra $200 for some people, and with OS X coming, you wanted all the processor power you could get, so I figured the extra value was there compared with the standard iBook – but it was questionable compared with the PowerBook if you could handle the extra capital outlay. Back in March 2000, Bare Feats did a benchmark comparison among four Macs, The high side of the low-end meets the low end of the high-side, including a 400 MHz Pismo and an iBook SE. The 400 MHz Pismo tested had 64 MB RAM and a 6 GB Toshiba hard drive, while the iBook SE also had 64 MB RAM and 6 GB Toshiba drive (times have certainly changed in RAM and hard drive capacity over the past seven years!). On a WordPerfect 3.5 find/replace, Pismo needed 4.3 seconds and iBook SE 5.0 seconds. In a WordPerfect scroll test, Pismo smoked iBook SE at 6.5 seconds vs. 15 seconds. Pismo performed a Bryce 3D 4.0 rendering test in 65 seconds – iBook SE needed 75 seconds. In a Quake 3 game demo, Pismo managed 29.8 frames per second – iBook SE only 6.9 frames per second. On hard drive speed (ATTO Express-Pro Tools 2.3 sustained write speed), Pismo handled 13.6 MB per second, with iBook SE slightly slower at 12.4 MB per second. Was the iBook SE a wimp? That’s probably a bit harsh, unless you were a gamer or into serious graphics video editing, notwithstanding the poor WordPerfect scrolling result. When the Pismo’s more powerful video card and/or extra 512 KB of L2 cache come into play, the iBook is bound to pale by comparison. But there is that $700 difference in price to consider as well. The iBook SE was a pretty powerful computer for the money. But I never bought one, and the fact that in 2008 and even later I had two Pismos in “B-team” production service speaks volumes. Both Pismos are significantly hot-rodded with G4 processor upgrades, DVD-burning SuperDrive modules, and one has a 100 GB hard drive. The iBook, on the other hand, was not receptive to hotrodding, with a soldered-to-the-logic-board processor, the aforementioned difficulty in swapping hard drives, no expansion bay, and only one RAM upgrade slot. 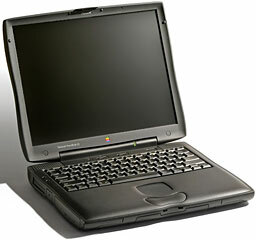 As a log-term value, the PowerBook has weathered the test of time much better. Still, if I was offered a Paris iBook SE (preferably in the relatively rare Key Lime livery) in good condition for fifty bucks like the one Carl found, I’d buy it in a heartbeat. * No, it isn’t a typo. Compleat is a legitimate, albeit archaic, spelling for complete. As Kenneth G. Wilson says in The Columbia Guide to Standard American English: “This obsolete spelling of the adjective complete suggests an air of antiquity that seems to please some of those who name things….” We find that fitting for Low End Mac’s Compleat Guides to “obsolete” hardware and software.